When Desmond D’Sa won the Goldman Environmental Prize in 2014, the South Durban Community Environmental Alliance (SDCEA) was fighting to stop the Durban Port and Petro-Chemical Expansion, now delayed for at least a decade! DURBAN, SOUTH AFRICA, 25 August 2016 – The South Durban Community Environmental Alliance (SDCEA) has recently won a protracted battle with Transnet after it was announced that the Durban dig-out port project would be delayed until 2032. 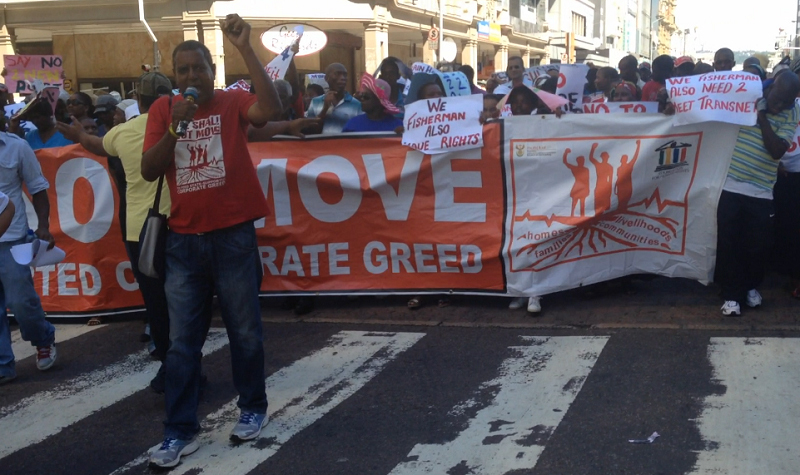 A community protest of the Durban Port Expansion led by Desmond D’Sa of SDCEA in 2014. As a result of SDCEA’s organised resistance over many years, the organisation was in discussion with Transnet, of which the final outcome was this latest announcement. This is an important victory for SDCEA and the communities it represents, as it means retention of the community space as a residential zone, and no displacement of residents and workers such as the old Durban airport farmers. The organisation, however, has come out stating that the fight for a community-driven development model in south Durban is far from over. Transnet has verbally stated that the 16 farmers that have been working on the old Durban airport land for 30 years will be secured another decade. SDCEA has, however, requested a formal written document be drawn up. SDCEA continues to fight for the farmers’ rights to maintain their livelihood on the airport land. “Farming is our livelihood, it is out basic survival and we do not know of anything else we can do if this is taken away from us,” explains Siga Govender, Chairperson of the Airport Farmers’ Association. “The potential negative impact on the environment and communities from the proposed port development and its related infrastructure outweighs the positives that have government has spoken about. We will continue to research, educate and inform, build our campaigns and stand up for people and our environment,” states D’sa.